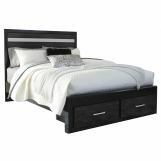 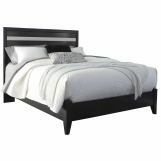 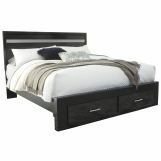 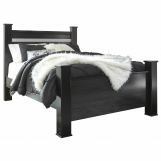 The Starberry Bedroom collection features a high gloss black finish with replicated straight silver walnut grain framed in a black finish. 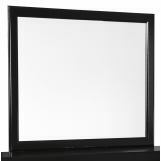 Luxurious mouldings and jewelry drawer fronts finished in a glitter material. 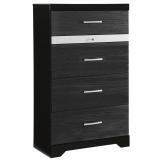 Chest and dresser feature felt bottom multi compartment jewelry drawer. 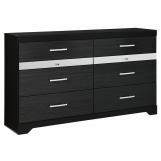 Chrome color handles accented with faux crystals and side roller glides for smooth operating drawers. 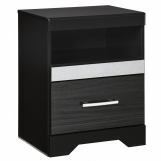 Slim profile dual USB charger for the back of the night stand tops. 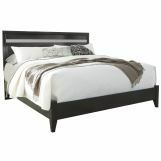 Panel headboard legs have four adjustable height options for optimal bedding height.